A lovely surprise from the best partner ever. Yesterday morning I was sobbing because I didn't think I was going to be able to record an EP before I head back to Scotland in a few weeks. All kinds of circumstances have been preventing it -- illness, travel, schedules that just don't match. Mostly, on my end, it's because I've been on constant baby-watch because of David's insane work schedule. This morning I'm optimistic, and it's all because David surprised me with an amazing gift. He's still stuck at work at all hours of the day and night, but he called a few friends and arranged for various people to come over and watch the wee boy for a couple of hours each evening this week in the hopes that I can at least attempt to record some music. I don't know if I'll be able to make it work, but his attempt (after I sobbed on his shoulder telling him there was absolutely nothing he could do to make it better and why did I even think I could still play music after having a child and my career is stupid and not really a career and oh I'm such a miserable person to be around I'm so sorry, etc, etc) is so sweet and kind and thoughtful that I'm going to try. Also, I saw this today, a nice article called 10 Ways to Love Someone with Depression. I'm on the upswing these days, particularly when the sun shines, but I've been a wicked mess since dealing with the postpartum funk. I don't know how David knew all of these things already, but I'm guessing it's because he's probably the most well-adjusted person in the world. The wee boy's party tricks. Just a little baby-boasting today because I'm trying to be thankful for all the awesome things my kid does, as opposed to being bitter that he STILL DOESN'T SLEEP THROUGH THE NIGHT. I know I'm probably supposed to be teaching my 17-month-old how to be a good person, but I am having a lot more fun teaching him trivia. He currently knows the capitals of Texas, Kentucky, and South and North Dakota. I taught him the Dakotas so as to blow the minds of complete strangers. "Go ahead, think of the most random state you can and ask him the capital." They always choose a Dakota. We've got to work on the wee boy's enunciation, but you can tell he's saying Pierre or Bismarck. He also knows the first President ("George") and the sixteenth President ("Lincoln"), as well as the dollar and five-dollar bills they go on. Of course he knows his animal sounds and all that, but I prefer teaching the tiny human party tricks. Enough boasting. I know, I know, your kid sleeps through the night. But does he know who Millard Fillmore is? I didn't think so!!! Show wrap-up and macaroni and "cheese" recipe. But let's go back to macaroni and cheese for a minute. I've got a recipe for you. My neighbor gave me this enormous box of whole wheat macaroni, and I stumbled upon a good use for it while making single people food a few days ago. David was in NYC all week for work, and it was too cold to walk to the grocery. In situations like this, I revert to "cooking" like no one is watching ... you know, meals that consist of an entire can of spinach or the mystery bag from the freezer. It involves one of my favorite soup recipes, so bear with me while I train-of-thought you around my head. All you do is immersion blend these things together. If it's too thick for you, add water or milk. Salt/pepper to taste. Here's where the GENIUS struck. I was boiling up some macaroni noodles, thinking how I don't like the taste of whole wheat pasta, but I know it's better for me, when I thought: MIX THE MACARONI WITH THE SWEET POTATO SOUP! Talk about weird, single people concoction, right? But it didn't seem like it would horrible. Also, I like my soup on the thicker side, so it actually looked like a roux at this point. Well, guess what? It's pretty fantastic. It's creamy, so it satiates the desire for cream and cheese if you're vegan (or just being healthy), but it's yummy yummy yummy. My 17-month-old even devoured an entire bowl and then demanded more "RONI RONI RONI!!" Blend cooked sweet potatoes, coconut milk, and curry powder together. Pour soup over cooked macaroni noodles SLOWLY and mix until you reach desired consistency. Save leftover soup for another meal. Salt/pepper to taste. * Correction ... it IS on video. But I don't know that I have permission to post such an intimate moment. I will treasure it always, however. A bunch of adult toys in my living room for once. For a couple of hours yesterday morning, my living room was filled with toys -- adult toys. No, not that kind of adult toys, but INSTRUMENTS! No Elmos, no hot wheels, no dolls, no diapers. Just a few guitars, a cello, an accordion, a saw, a piano, and two musicians. It was the best. I'll be home all day today being Mum, but tomorrow night I'm looking forward to playing some beautiful music with my friend Peter Searcy. You might not know that he is an incredibly gifted cellist. He even put out a great acoustic guitar/cello album long before it was the cool thing to do. Tomorrow's show is a supper club vibe. We start at 9:00 at the Monkey Wrench on Barret Avenue and will play two sets of mostly piano/cello stuff. There will be some guitar/accordion thrown in there and some saw too, I'm sure. But it'll be a laid-back evening of lots of songs I haven't played in a long, long time. Travel plans to appease my wanderlust and some pretty pictures. I'm going back to Scotland in April! How exciting is that? Well, I guess it's only exciting for me. But you know you're in a horrible winter funk when you are daydreaming of Scottish weather in this disgusting tundra that is Louisville. Scottish friends, stop hating your climate and start appreciating the mist and the mild temperatures. Louisvillians, let's start talking about moving somewhere else. And yes ... the wee boy is coming with me to see his homeland. In honor of this, I'm just going to post some disgustingly beautiful photographs of Scotland. P.S. If Aneil in Wolverhampton is out there reading, let me know if there's a place to play near you. This is a pleasure trip, not business, and I'm only playing a couple of shows -- the Leith Folk Club on April 8 being the big one. I don't want you taking a taxi several hundred miles! Why "you are not alone" is really annoying advice. We all know that social media is great for keeping up with friends and terrible for feeling good about yourself. 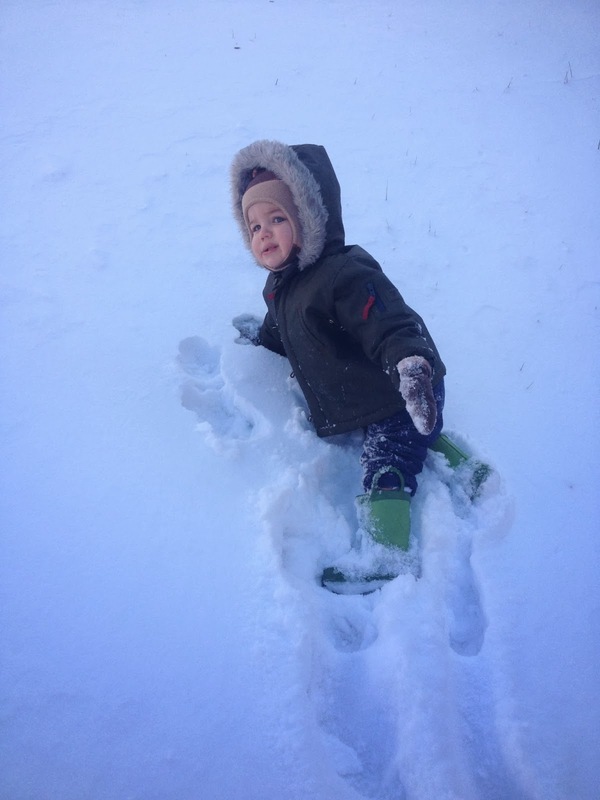 I've read more articles and blogs on parenting than I ever thought I could, and one theme sticks out more than any other: the idea that you are not alone. Basically, every article that talks about how we are the first generations in history to try to raise children without grandparents, aunts, uncles, cousins, the village, etc, all helping us out ... well, those articles may be right, but they don't make my day any easier. They tell me that I'm not supposed to be able to handle it all, but that doesn't make me suddenly able to cope with things perfectly. But, yes, I really am. I'll put a cute snow picture up to make up for it. Brigid show on 2/15 and Snow Ice Cream! I'm playing a show at the Monkey Wrench in Louisville on February 15. That's a week from Saturday, folks. It'll be stripped down -- like Brigid Kaelin Unplugged™. We've got a few other things in the works, and I'm working on a start time right now. It'll be on the early side because I turn into a pumpkin after 10pm. 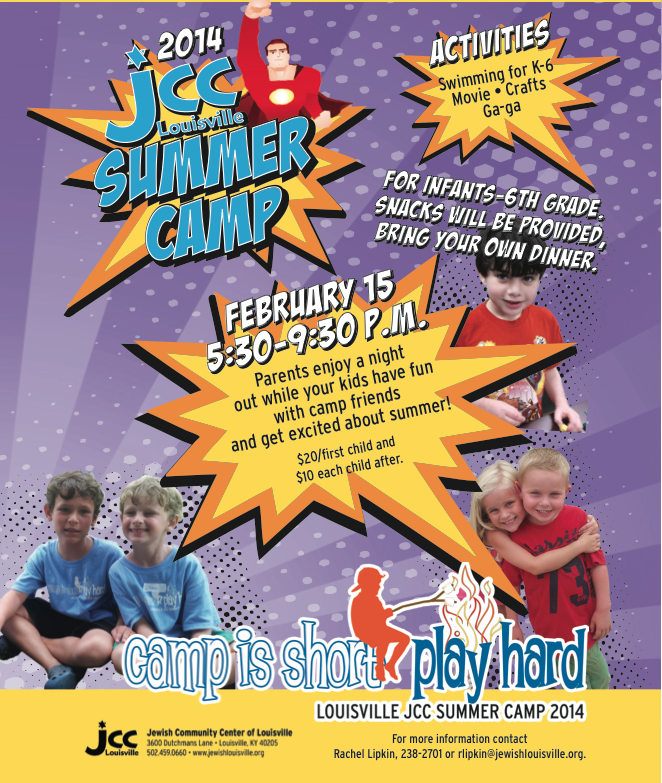 On that note, if you are looking for a good date night out without the kids (because date nights WITH the kids aren't that much fun), check out this cool service the JCC is offering on February 15: a Parents' Night Out! How cool is it that it's the SAME NIGHT AS MY SHOW? 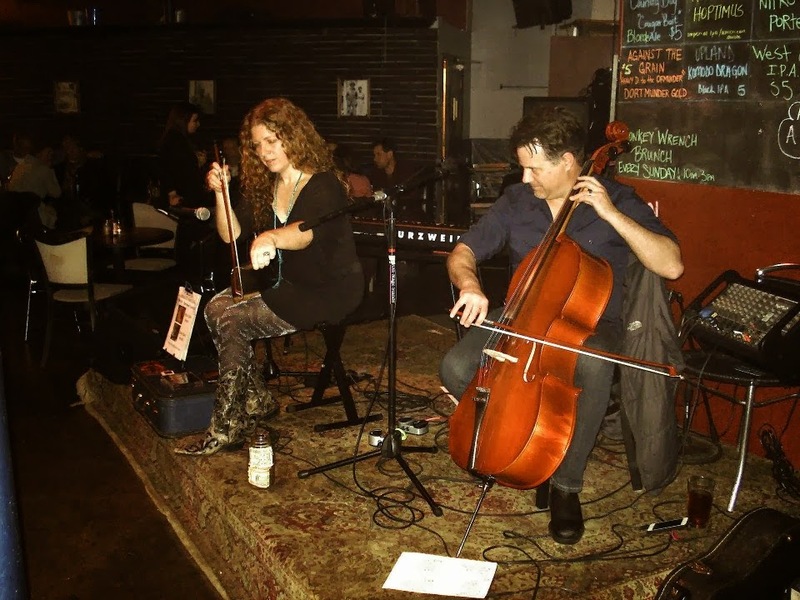 Wouldn't it be neat to drop off the kids, go have a nice meal at the Monkey Wrench, which has completely redesigned its menu with a fancy new chef, and then hear some great live music at the same venue? 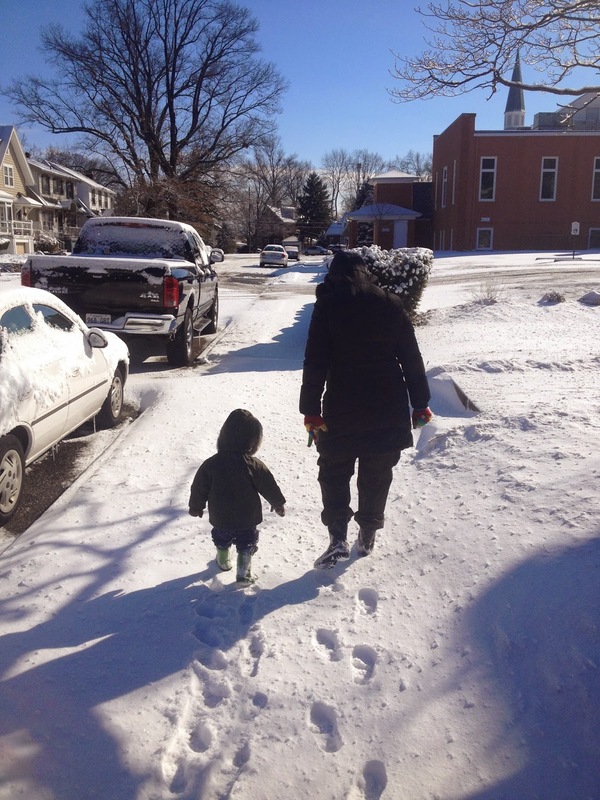 Every day is kind of like a snow day for us because I only teach lessons 3 hours a day. The rest of the time is spent on baby duty. I've gotten a lot of suggestions for what to do when I'm home with the wee boy on a snow day, but they often read like our daily schedule anyway. He has already played with every pot, pan, and kitchen utensil. He likes to help make cookies and soup, which he refers to as "helping onions!" (We chop a lot of onions in this house.) Every pillow and cushion in the house is in the dining room at the moment. 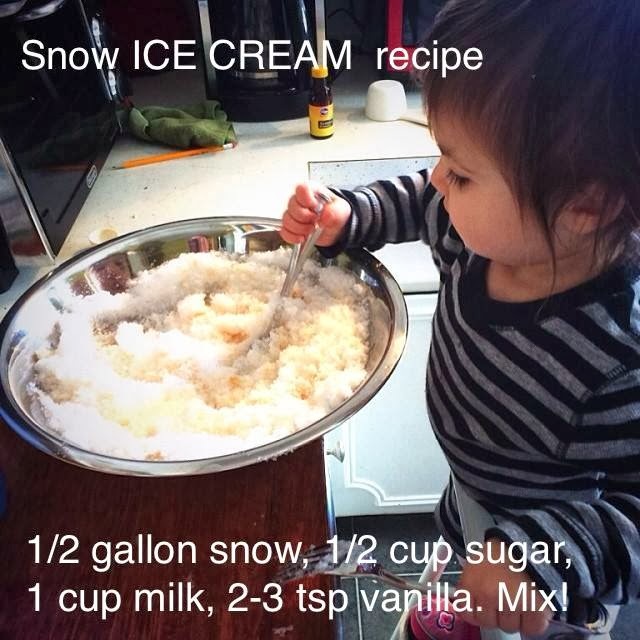 We even made snow ice cream yesterday. Never heard of snow ice cream?! I hadn't either, but David apparently made it all the time as a child, in those frigid West Texas winters. It's pretty good. To me it tastes like those strange milkshakes you could buy in the frozen food section back in the 1980s that you put in the microwave to prepare. Does anyone remember those? David thinks I'm making it up, but he's a few years younger than I am. Live show photos, a radio show appearance, and a little bit more crazy. Friday's show was oversold-crowded and SO much fun. Alex Wright was fantastic with his 9-piece?!?! band. I pushed the envelope myself and played with a 5-piece for the first time, opting to leave my acoustic guitar at home. Dan Canon played electric and Steve Cooley moved over to acoustic guitar for the night, and it sounded so so so good. I got to play a lot more accordion because Steve was there laying down the acoustic grooves, and who doesn't love more accordion? If I can ever figure out how to get these videos into iMovie and trim them down, then I'll post some good stuff from my set. Sunday afternoon, I appeared on Crescent Hill Radio for their Made in 502 radio show, an hour long program where I answered a lot of questions and sang a lot of songs. I sang four songs like, including two unrecorded tunes. I answered a lot of questions (probably not in complete sentences because I can't think straight because I haven't slept in two years) and philosophized about stuff and got more airtime than they probably should have allowed. So now is the part of the blog where I mention my baby. Playing sold-out shows and doing little publicity radio shows makes me feel normal. Then I wake up today and am ready to make a new record. But what have I done so far? Played trucks, read stories, made snow ice cream, made a pot of soup, and gotten poop on my hands (twice). I know, I know, I'm trying my hardest to appreciate the little stuff, but I feel all crazy out-of-balance and identity-confused. I saw a LOT of fans out there on Saturday night singing along, and a LOT more people asked me about making a new record. It's about time, right? BUT WHEN WILL I HAVE THE TIME?? ?